Inspired by the discovery of the red nova V1309 Sco (Nova Scorpii 2008) and the fact that its progenitor was a binary system with a rapidly decreasing orbital period, we have searched for period changes in 22 462 short-period (Porb<4 d) binary stars from OGLE-III Galactic bulge fields. The OGLE-III dataset (years 2001-2009) was supplemented with OGLE-II photometry (1997-2000), the first six years of OGLE-IV (2010-2015), and, for some stars, with OGLE-I photometry (1992-1995). We have found 56 systems with realistic period decrease and 52 systems with realistic period increase. We have also recognized 35 systems with cyclic period variations. 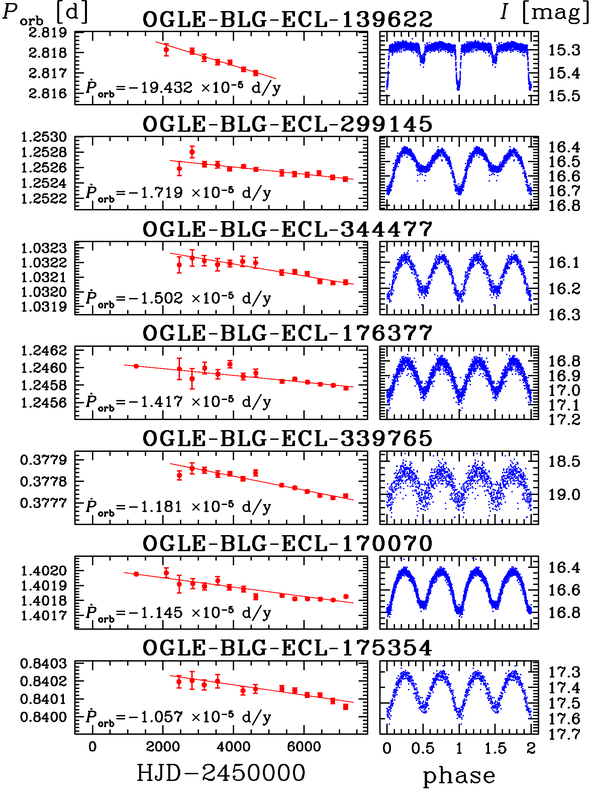 The highest negative period change rate has been detected in detached eclipsing binary OGLE-BLG-ECL-139622 with Porb=2.817 d, while all other found systems are contact binaries with orbital periods mostly shorter than 1.0 d.
We report an excess of systems with high negative period change rate over systems with positive rate. We cannot exclude the possibility that some of the contact binaries with relatively long orbital period and high negative period change rate will merge in the future. 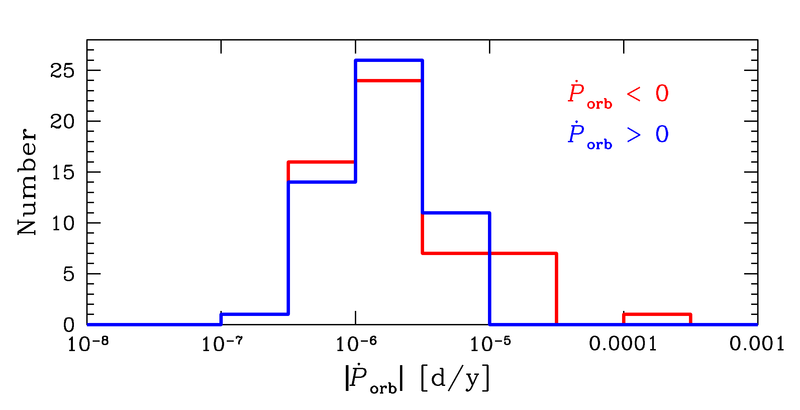 However, our results rather point to the presence of tertiary companions in the observed systems and/or spot activity on the surface of the binary components. Pietrukowicz et al., 2017, Acta Astronomica, 67, 115 (arXiv:1706.06647).